Free Readings with The Mysticfairy. Mystic Chat open by invitation or random announcements. 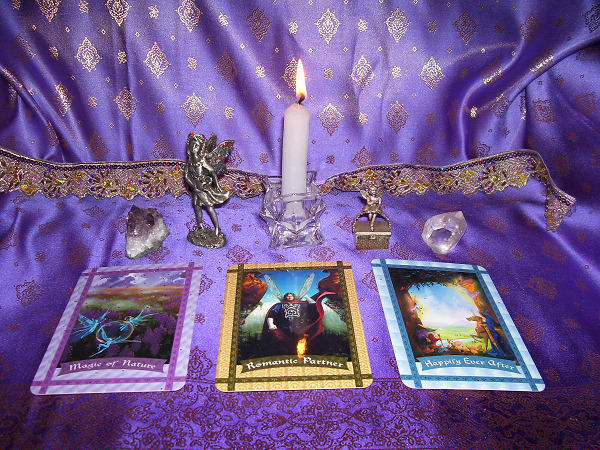 You may request a reading please email themysticfairy@yahoo.com. 1 Question & 1 Card. Please have your question ready. Phase question such as... I am unhappy about my job, what should I do? I do not answer yes or no questions. The more detailed your question the better your reading. Questions will be answered using my oracle of choice for the day, along with any psychic impressions I receive. Current Deck In Use: Inner Child Oracle, Universal Wisdom Oracle, Fairy Oracle/Tarot or Angel Oracle, Rider Waite Tarot, Bohemian Gothic Tarot, Triple Goddess Tarot, Power of Flowers Oracle, Life Elixer Oracle. Photo Card Examplar *Healing with the Fairy's* Oracle Deck. Please add your first name and location at time of email. Your question and what card deck you would like me to use. Day & Time available to chat. I will confirm reading via email & we will meet here at set time. Mystic Chat Hours M-F 8:00AM-5:00 PM Eastern Standard Time. Please allow 10 min. in a quite space. Feet firmly planted on floor, spine staight. After meditation take a moment to adjust, baske in healing light, drink a glass of water. At this time you may feel you hands warm or tingle, or a bit loopy. Take a moment before standing. Thank you for visiting my page at Goddess of the Mirror. Please come back and visit again!